The psychology of perception shows us seeing requires contrast. Artists learn about color by seeing the difference between the contrasting values of color systems presented against different backgrounds. We see that our judgments of colors are never independent of context. Science has also proved that humans may all also see colors differently. So, aside from changing context that determine color perception, there is also the fact of human physiology. However, what binds humans together in our world is how affectively we all respond the same to colors. Should we take the same principle to matters of decision making of contrasting data, something very similar happens. The simplest forms of judgments we make, those modes of binary thinking that draw upon contrasting values, i.e., evaluative conclusions, require acknowledging how the context of framework of a picture of something change the timbre of our perceptions. Empirically we may have difficulties substantiating our decisions while everyone shares the same affective experience. At the same time, we may be rest assured that the decisions we make are justly and objectively shared by others. Making those choices involves additional complications. To begin with, conflicting data reveals contradictions. Aesthetically, we are confronted with dissonance. The colors do not resonate with each other, and there is an overall feeling of disharmony. The given information in a picture fails coherency. In such an instance, our usual habits of problem solving seem to fail us, and we have nowhere else to turn. We not only question if our knowledge is illusory but also whether or not we are being fooled by the guise of things. Left without bearings in tacit awareness and intuition alike, the brain suffers a kind of paralysis from not knowing what to do. Caught in the throes of such difficulties, a person making judgments is in no different a position than an artist struggling to render a coherent pictorial idea. However, the difference between an artist and it seems the rest of the world is she actually leans towards such difficulties of ambiguity. For an artist, the conditions of alterity proffer the potential of new meanings. The rest of the world can benefit from this experience to open up new horizons in the mind and shake those old gut instincts that carve out preconceived pictures of the world in our minds. Few studies have actually been written on how artists handle ambiguity. Most studies (most notably Rudolf Arnheim) in aesthetics emphasize gestalt perception. A generation of art educators have followed along the lines of this tradition and established a cognitive model of artistic perception as the foundation for teaching pedagogy. In truth, the learning to be gained from art is how to resist compacting a work of art into a fixed idea. When artists are making art, at least those most successful at it, they do not create works with an easy solution. The viewer must explore the image and seek out those areas to ponder similarities, differences, contradictions and associations. The poststructuralist literary criticism of Jacques Derrida bears some light on this difficulty of rendering meanings from binary oppositions. Without discounting its relevance to feminist applications of his ideas, the importance of what Derrida illustrates in his deconstruction theory is the potential of a rigorously logical method of inquiry, which is ironically espoused by those who have no faith in logic at all. As we delve into the mystery of things like words, we learn to unlock modes of thinking, we decipher the ciphers and unveil the apparent guise of things. The experience is sublime no differently than Theordo Adorno used the word “Erschüttert,” to describe a vision of something that takes us into the deepest abyss. 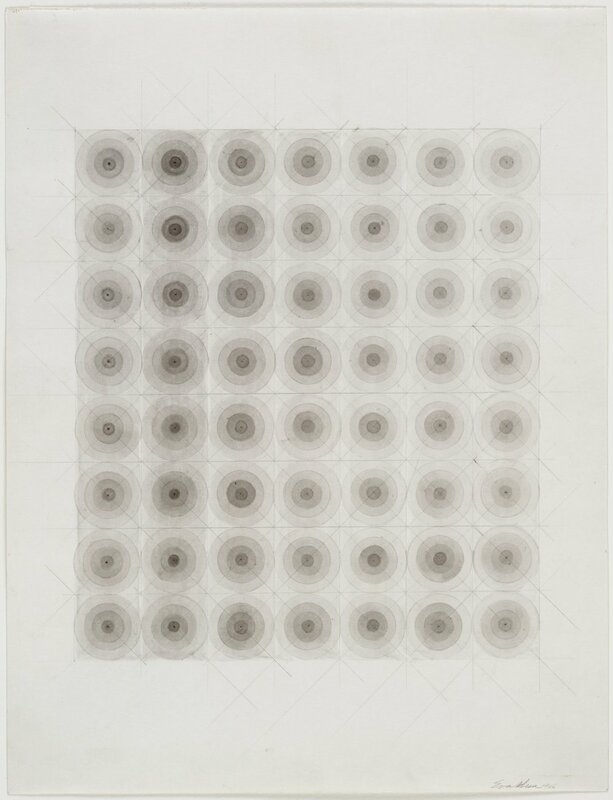 In her black and white drawings of grids and circles, the post-war Jewish American artist Eva Hesse embody the idea of dissonance in just black and white, the most basic binary opposition possible. The power of the visual subtleties of these works cast light on the darkness of an idea. This darkness which is light brings forth a language of interiority, meanings which are implicitly understood. The serial pattern seems to indicate an inexhaustibility of a fundamental conflict. However, we see each of these pictures as a complete statement. Believe it or not, in those tiny inflections of the graphite pencil and black ink, there is a wellspring of affective qualities. From this condition of dissonance or ambiguity, the artist finds a place of effusive self-expression, always revolving around one central idea. Within the parlance of American post-war art, she found the means to structure her expressive message: should we say the life of a Jewish woman or the story of a German tragedy? For certain, the outcome of a war of signs and meanings can never exist without at least an existential crisis. In no situation in business, science, technology or law could ever such circumstances appear without a serious conflict. Where do we look for the outcome? When we see something that is completely nonsense, a total surfeit of reason stretched to unreason, we may find that answer within the eyes of the beholder.